Graduation is scary. The real world is scary. And getting a job? In your chosen career field? That pays a livable wage? Right out of the gate? Well now — that’s a whole new level of terrifying. Luckily, there are some steps you can (and absolutely should) take while you’re still in college to up your chances of landing your dream job post-graduation. To find out what those steps are, I spoke to Dr. Jamie Chilton, a career consultant at the University of South Florida who specializes in the College of Engineering and the Florida Center for Cybersecurity, and to Peter Thorsett, the Communications and Marketing Officer for the Career Services Office. Your first year at college is a whirlwind of new friends, football games and remembering to call your mom once in awhile. But there are steps you should be taking even now that will help you land a sweet job at the end of your college career. Your career isn’t a destination — it’s a journey. At least, that’s how Dr. Chilton explained it to me. Make Career Services your first stop after moving into your dorm. The advisors have resources available to help you make a plan for the next four years, and, according to Chilton and Thorsett, there’s no such thing as “too early” when it comes to preparing for your career. That said, your first year on campus should also be a time of “career exploration,” as Dr. Chilton calls it. Take this time to explore things that excite you and make sure you’re on a career track you’re happy with. Important: don’t skip the visit to Career Services just because you’re a liberal arts major with an undefined career path. While the technical majors have structured programs that will land them in the career services office for frequent check-ins, the arts majors usually have to make a conscious effort to plan their futures — so don’t think that just because you’re on a winding career path you can’t use career services. You can, and you should! If you can sort through the overwhelming insanity that is the organization and club recruitment fair, you’ll find some really awesome groups full of like-minded people that will help move you along your chosen career path. You shouldn’t have any trouble finding a finance club or a journalism club, and most schools even offer college-level chapters of professional organizations. Once you join a group that’s in line with your goals, pursue a leadership position, advised Dr. Chilton. Aside from picking up great real-world experience in people- and project-management, having a title like “Chapter President” will give you an extra boost on your resume. “There’s always a new level of competition that’s being created in the technical field,” she noted, so that extra bit of experience may be the thing that sets you apart later on. Your second year will seem pretty lax — your class load shouldn’t be too heavy, and you’ll be comfortably in the college groove. But that doesn’t mean you should be lax about your future career! Now’s the time to start the search for internship opportunities. And yes, you do want to start looking as early as your sophomore year (or maybe even the summer before it starts). It used to be that having one internship on your resume was enough to get you in the door at most companies, but that’s no longer the case. According to Dr. Chilton, having two internships under your belt is the new norm — the minimum students should be aiming for. But having three internships? That’s what makes you competitive. “The students that I see that are taking six months or longer [after graduation] to find their first job are the ones that have had no internships,” Dr. Chilton noted. Plus, more and more companies are offering paid internships — so if you’re looking for a little work to help with tuition, why not skip flipping burgers and go straight into your career field? If you can’t find an internship that meets your needs, however, we’ve got some ideas on what to do to ensure you’re not falling behind your peers. Start putting your name and face out there. Go out of your way to meet with professors, other students, university alumni, your parents’ friends, that one dude you exchanged pleasantries with in the Starbucks line — anyone who may be able to pass your name along when the time is right. Attend career fairs, and start collecting business cards from everyone you meet. Create a LinkedIn account to keep track of the contacts you’re making. Not everyone will be a potential employer, but everyone will know someone who knows someone who might be. Also, remember all those organizations you joined in your freshman year? Smart move. Dr. Chilton explained that employers go directly to student organizations when they’re looking for new talent. Which, she points out, is a direct link to help you jumpstart that networking process. And if there’s a company or employer that you’d like to connect with but haven’t had a chance to, Dr. Chilton recommends taking the initiative yourself when it comes to networking. Organize a site visit or invite that employer to come talk to your class, and you’re suddenly on their radar as an organized go-getter who takes an interest in their field. Junior year is said to be the most difficult: classes have kicked up a notch and it’s no longer acceptable to just coast through to the weekend — or to graduation. Regardless of your major or chosen career path, take the time to create a personal website or blog — a platform on which to voice your opinions, delve deeper into your areas of interest, and showcase your portfolio. If you’re in web, tech, writing, design or a related field, your website may even act as a portfolio all on its own. For everyone else, it simply shows employers that you have the initiative to explore your field, a rounded understanding of online platforms, and some basic literacy (you’d be surprised how far that last one will take you in impressing employers). If you’re thinking about going to graduate school, junior year is the time to start planning. Applications are generally due in the fall semester of your senior year, so you’ll want to get started sooner rather than later. In addition to studying for the GRE and researching graduate programs, you should develop a personal research project, or at least a concentrated area of interest. During the admissions interview process you’ll be asked time and time again about your passion projects, and it helps to have a developed focus to talk about. Cue the tears. Or, I mean, um, cue the impassioned drive to finish strong and take the “real” world by storm. Take advantage of every resource your college is offering you: sit in on seminars, attend job fairs, and take advantage of career events like your future depends on it — because, well, it sort of does. Seminars can teach you more about your chosen industry in three days than a class can teach you over an entire semester. And since seminars are led by speakers and panels made up of experts in the field, they’re also great for helping you broaden your network. Job fairs are a grab-bag opportunity to explore different companies, meet possible employers and do some recon on the companies that are currently hiring. Outside of job fairs, Career Services offers a ton of other events to help you make connections and prepare for your future career. 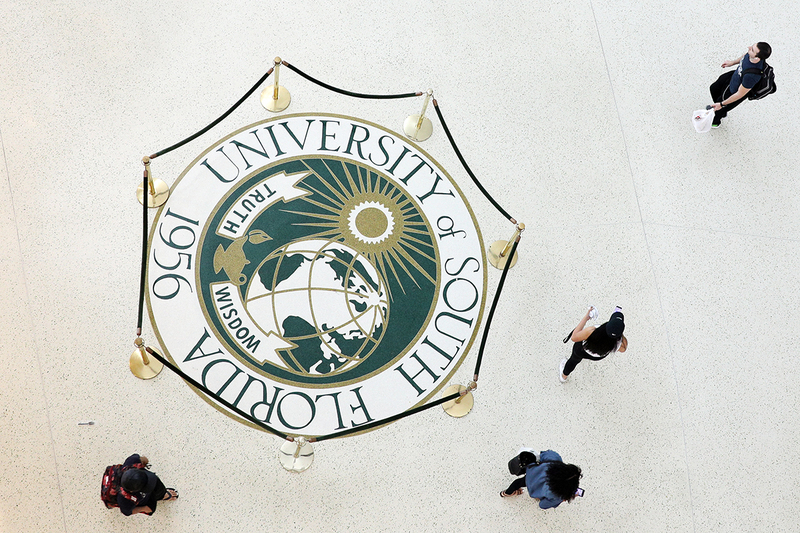 For example, the Office of Career Services at USF hosts an event called “Careers and Coffee” where students can casually mingle with potential employers and mentors over a cup of coffee without even having to leave campus. Some universities allow you to use alumni career services for free for a few months (or even forever) after you graduate, but why wait? The job market is competitive, and you’ll want to be as far ahead of the game as possible — so take advantage of these resources while you’re still on campus. According to Chilton and Thorsett, you should begin interviewing seriously with companies six to nine months before graduation. Take advantage of career services’ mock job interviews. Practice answering common interview questions in a neutral setting, and learn how to present yourself to potential employers, sans all the pressure that comes with a high stakes interview with your dream company. Dr. Chilton encourages students to begin practicing their interview skills early and often. If you wait, she points out, it may be too late when you realize that you have unprofessional habits you don’t have time to work out. Plus, you’ll start to learn how to read employers — and more importantly, how they’re reading you. Thorsett notes that you should take every interview opportunity you’re presented with, especially early on, because employers are going to cut a student a lot more slack than a college graduate when you’re fumbling your way through an interview. Also, remember that the interview process doesn’t stop there: make sure you’re up to date on the entire process — from submitting your resume all the way through to accepting an offer and negotiating a contract. In today’s society, you are who your social media says you are — so make sure that your online persona isn’t sabotaging your job hunt. According to a 2016 survey published by CareerBuilder.com, 60% of hiring managers use social networking sites to screen potential candidates. And why wouldn’t they? We put so much of ourselves out there for the world to see — it’s only fair that employers use these platforms as an additional tool on their end to determine who would be the best fit for their company. At this point, you should already have a working resume — but take it down to Career Services to be looked over with a critical eye. Then, take the time to polish up your LinkedIn profile — remove those high school gigs, update your skills and experience and add your newest connections. This is also the time to start asking for letters of recommendation and collecting contact information from anyone who might serve as a professional reference for you later on. When a potential employer asks for a few names and numbers, you can hand over some trusted resources without having to scrounge around (but always ask permission first!). Finally, work on curating a professional portfolio. It should include a good selection of your best work from your classes and internships, and should provide a hiring manager with a good grasp of your skills range and areas of interest. Whatever you do, don’t wait until the week before graduation to accomplish everything on this list (yep, people actually try that). Your career path begins during your freshman year — not after graduation. “I do get really concerned for those students who, right before graduation, come to see me,” Dr. Chilton said as we finished our talk. Her advice? You should do one good thing for your career each week, even if it’s just 10 minutes at a time. That way, when graduation rolls around, you’ll be ready to take on the working world.